Bright and Breezy Crafts: A sweet birthday. 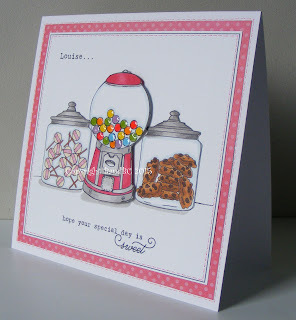 lollipop jar, bubblegum machine and chocolate chip cookie jar. I made this card for a friend at work - Louise. so I thought this would suit her down to the ground! I wanted them on my card. The bubblegum machine has been popped up slightly on 3d foam squares. and I found a similar font on my pc, to create her name. and added some shadows with my grey promarker. I just love this card and how you used three of my images on it. Great job! Vicky - I bet Louise is going to love this card. From your description she's the perfect person for this. Great job, awesome coloring of all 3 images! Oh my! What a lovely trio of 'eye candy' you've treated us with today! Stunning! And now I'm craving something sweet! Thank you so much for sharing your abundant creativity in the ATSM gallery! Great Card. Nice and bright.